Lead by third year English and Media Studies student Patrick “Paddy” Prichard, the society will also be hosting an annual Gala show on 22nd April which will include a Stand Up Comedy Competition. The winner, decided by three judges including a Pontio representative, will get the chance to perform a warm up stand up set for Seann Walsh, alongside the comedy stylings of Bangor Comedy Improvisational Branch, ImpSoc. 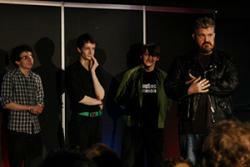 Comdey Society members performing with comedian, Phil Jupitus last year.Bangor Comedy Society currently has around 40 performing members and has gone from strength to strength in the past year. They have hosted dozens of shows throughout the year and even supported Phil Jupitus at The Giddy Goat Comedy Festival last year. The society invites anyone interested in writing, producing, performing or directing comedy to come and have a go or simply to attend their regular sell out shows in the Main Arts Lecture Theatre or their bi-weekly shows at the Belle Vue in Upper Bangor. The opportunity to perform with Seann Walsh provided by Pontio gives Bangor Comedy a route into the professional world of comedy; a notoriously difficult industry to break into. Seann Walsh, star of Channel 4’s “Stand up for the Week” is a rising star on the UK comedy circuit, boasting such accolades as the Leicester Mercury Comedian of the Year, Chortle Best Breakthrough Act Nominee 2010 and Chortle Best Compere Nominee 2011. “My thanks to Pontio on behalf of Bangor Comedy for inviting us to get involved with this event and their enthusiasm and support throughout. I hope Bangor Comedy and Pontio will continue to work together on projects such as this in the future!!" Tickets for the Seann Walsh show are £8 and include free entry to the Bangor Comedy Gala show, usually £3. Tickets can be purchased on the Gala night or from the Comedy Society directly. 1) Bangor Comedy can be found on Youtube here . 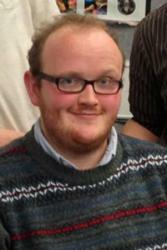 Bangor Comedy can be found on Facebook here .